Town and Country Gardens > Uncategorized > Why Do Trees Turn Color in Fall? The downside of living in the northern part of the country is that most trees lose their leaves for the winter. The upside is that many of them really put on a show before the snow begins to fly. While east Idaho may not have the reputation of New England for fall colors, nature still has a beautiful palette of colors this time of year. As days shorten and temperatures drop, the tranquil greens of summer transform into spectacular yellows, oranges, reds, and maroons. The vividness of color is affected a great deal by the weather, so some years are more colorful and the color lasts longer than others. Some years can be truly breathtaking. What makes leaves turn color in the fall? The process is triggered by day length. As the days get shorter in the fall the trees “know” it is time to shut down and get ready for a winter rest. In early autumn, in response to the shortening days photosynthesis decreases, then stops. At the same time the veins that carry fluids into and out of the leaf gradually close off as a layer of cells forms at the base of each leaf. These clogged veins trap sugars in the leaf and promote production of anthocyanins which are responsible for the red and purple colors. Once this separation layer is complete and the connecting tissues are sealed off, the leaf is ready to fall. It is the combination of all these things that make the beautiful fall foliage colors we enjoy each year. Three types of pigments produce autumn colors in plants- chlorophyll, which gives leaves their basic green color, carotenoids, which produce yellow, orange, and brown colors, and anthocyanins, which produce reds and purples. Both chlorophyll and carotenoids are present in the chloroplasts of leaf cells throughout the growing season. When photosynthesis stops, the green disappears leaving yellow and orange colors that were there all along, but were masked by the green chlorophyll. Most anthocyanins are produced in the autumn, in response to bright light and excess plant sugars within leaf cells. Certain colors are characteristic of particular species. Oaks turn red or brown; aspen, birch and poplar turn yellow; dogwood and chokecherry turn purplish red; maples differ by species- some turning red and others orange or yellow. Leaves of some species such as the Siberian elms common in this area simply shrivel up and fall, exhibiting little color other than drab brown. The amount and brilliance of the colors that develop in any particular autumn season are related to weather conditions that occur during summer and early fall. Soil moisture and temperature are the main influences. 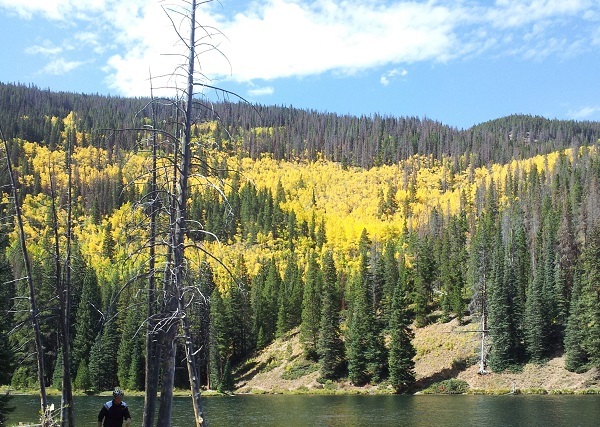 Drought can affect the intensity and the timing of fall colors. Temperatures can also affect it. A warm period during fall (like we experienced this year) will lower the intensity of autumn colors. A succession of warm, sunny days and cool, crisp but not freezing nights seems to bring about the most spectacular color displays. During these days, lots of sugars are produced in the leaf but the cool nights and the gradual closing of veins going into the leaf prevent these sugars from moving out. These conditions spur production of the brilliant anthocyanin pigments, which produce reds and purples. Because carotenoids are always present in leaves, the yellow and gold colors remain fairly constant from year to year. 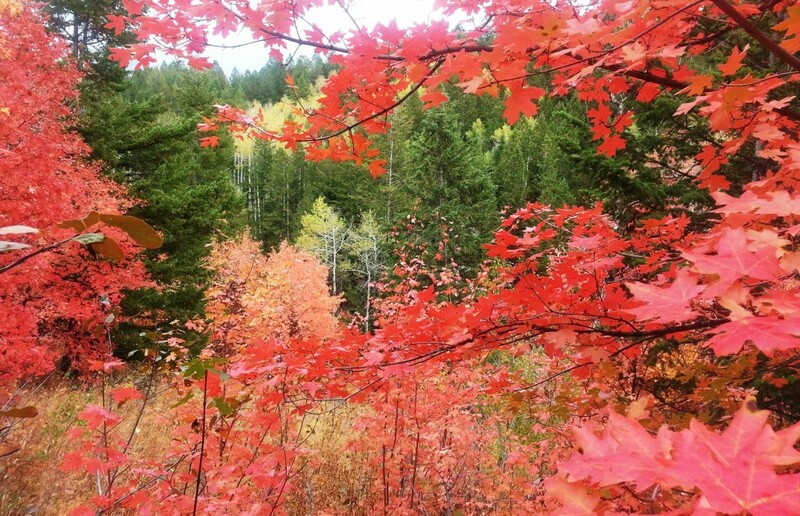 Timing varies from year to year, but in east Idaho colors are usually at their peak sometime during late September through early October. Higher elevations will begin showing color first, with lower elevations following shortly thereafter. 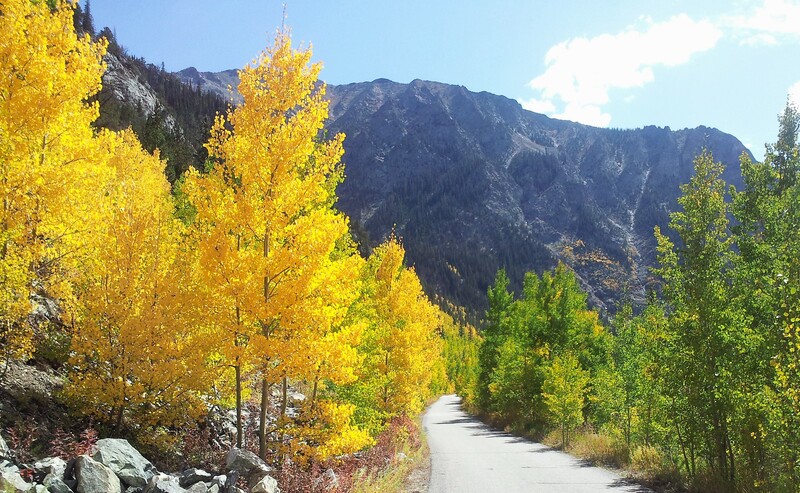 So now is the time to get out and enjoy nature’s incredible palette of autumn colors.